It is hard to believe Dark Armed Dragon is nearly 10 years old, heck it is hard to believe the whole Phantom Darkness set is nearly 10 years old. That set was really cool in my opinion. Yes, for Throwback Thursday this week, we look at Dark Armed Dragon. Dark Armed Dragon can be Special Summoned from the hand if you have EXACTLY 3 Dark Monsters in the GY, and that is the only way he can be summoned (unless you can ignore the summoning conditions with certain cards I believe). DAD also allows you to banish a Dark from the GY to pop a card on the field, and it is neat that this isn’t once per turn. Back in the day, with Tele-DAD and other DAD based decks, graveyard manipulation allowed this card to be a true powerhouse. Malicious is a prime example. Thanks to the Tele-DAD deck basically being Tier 0, this card is at one and hasn’t moved in the TCG since I believe. OCG has it at 2 or 3 I think. The card is great, but can be a huge brick if your GY gets filled up with too many Darks. It is still a great card in Dark decks, especially if you can easily manipulate the GY. Just now a days, you can’t afford a brick like this unless you can manipulate said GY. Ahh what a throwback today. Dark Armed Dragon use to be all the rage, remember that? He still sits Limited on the Ban List too. And with good reason, this thing is powerful and unwiedly so. 2800 attack, so easy to bring to the Field, and a 1-for-1 destruction effect simply by removing a Dark Monster from your Graveyard from play. Dark is awesome, and Dragons have so much support these days. He’s a winner for sure. Dark Armed Dragon (DAD for short) once ruled the meta. It helped cause an emergency ban, something that hadn’t happened before. Even now, it is still very powerful. Three DARK monsters exactly in the grave isn’t hard at all to do. After you drop DAD on the field you can load your grave up with DARK monsters and machine gun your opponents field. At 2800 DAD is such a beast of a monster. Dragon support and DARK support plenty in the game, you can easily get this monster back to summon again and again. Level 7 allows for Rank 7 plays after you’ve cleared the field with its effect. Regardless of the meta, regardless of what is on top, Dark Armed Dragon will always remain a great boss monster for DARK decks to consider using. Zombies, Darklords, Spellcasters, Blackwings, Shaddolls, so many decks can run this card. Yes, if you can’t manipulate your grave to have three DARK monsters exactly when you have this card, it becomes dead. Getting this card early and having the three DARK monsters to get into the grave is key. Late game this card could be the dead of you. Eclipse Wyvern is the only real good way to search this card, unless you are playing a dedicated dragon deck that runs Draconnection. There’s a reason why it’s still Limited after all this time: it’s still that good. Dark Armed Dragon is a great boss. It’s a Level 7 Dark Dragon-type monster with 2800 Atk and 1000 Def. The Def is relevant slightly because Witch of the Black Forest is back. 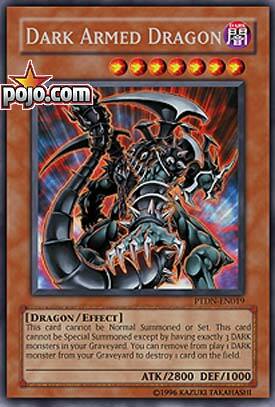 Also, since Red-Eyes goes in and out of style, being a Level 7 Dark Dragon can be a good back up plan. Especially since this one can destroy cards on the field up to the number of Dark monster fuel in your grave. Sadly, it can’t be Normal Summoned or Set, but the Special Summon requirement from the hand is just to have exactly 3 Dark monsters in your grave. This can pose a problem in the late game if the grave is filled up, but it’s still worth running at one. 2800 Atk is still powerful, so just attacking with a big monster is worth considering. Dark Armed Dragon is definitely worth play since it doesn’t even need a Link Monster to do great things. Next articleTwitch is running a Yu-Gi-Oh Marathon this month!